As soon as we published the very popular and successful Panzer Grenadier: 1940 The Fall of France, I knew we’d want to publish designer Philippe Léonard’s sequels soon afterwards. Avalanche Press hit a few potholes on the Road to Dunkirk, but after a lot of hard work we’re finally back on track and making this fine game a reality. 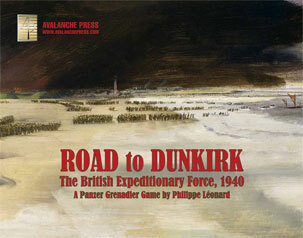 Road to Dunkirk covers the battles of the British Expeditionary Force in France and Belgium during the spring of 1940, as the BEF fought to hold back the onrushing German panzer spearheads. The game is intended as a matching piece to 1940 The Fall of France, as we’ve done with other Panzer Grenadier titles, but its concept and organization are much closer to those of Broken Axis or Invasion 1944 than 1940 The Fall of France, which pre-dates our current way of doing things. Road to Dunkirk has 47 scenarios, and they’re organized into six sections, each of which covers one segment of the campaign with both historical text and the scenarios themselves, which serve to help advance the narrative of the story line. That puts each scenario in its historical context, bringing the game far closer to an actual historical study of the campaign that would be possible with a dozen scenarios selected at random from across a broad range of dates and locations. Each section then has its own “battle game,” which ties the scenarios together with its own set of operational victory conditions. You can play any of the scenarios individually, or string them together for a more intense gaming experience. It’s an innovation introduced into Panzer Grenadier games by developers Matt Ward and Daniel Rouleau starting with The Kokoda Campaign, and it finally accomplishes something I’ve wanted for our games since the founding of the old Avalanche Press. The games now integrate history into their very structure, without one element feeling like it’s simply a veneer layered onto the other. The story here has the BEF engaged in a fighting retreat, doing its best to slow the German advance. On an operational and strategic level, the Germans had enormous advantages in 1940. But at the tactical level – where Panzer Grenadier games lie – the British and their French allies had numerous advantages of their own. While the French have much better tanks than those of the Germans, British tanks aren’t quite as capable. The most numerous British tank, the light Mark VIb, is a bad tank by any measure: only slightly faster than real tanks, nearly unarmored, with no anti-tank capability. The A9 is better, but still not very good. The A10 and A13 cruiser tanks don’t appear in very large numbers, but are much closer to matching the German panzers. The Matilda tanks – both Mark I and Mark II models appear – aren’t numerous either, and are very slow, but they are pretty much indestructible as they slowly waddle across the battlefield unless they run into the German Air Force’s 88mm anti-aircraft guns pressed into a ground-combat role. The strength of the British Army lies in its infantry. British platoons are smaller than those of the Germans (30 men for a British platoon, 46 in a German platoon) but the British infantry battalion had 12 such platoons (four companies of three platoons each) where the German battalion had but nine (three companies of three platoons each). Although British firepower seems deceptively weak, the two armies are getting about the same firepower from the rifle elements of their battalions (48 factors for a British battalion, 45 factors for a German battalion). While Panzer Grenadier is a relatively simple game to learn and play, we’ve tried to weave a lot of elements into the game’s structure itself rather than present them as separate rules. The British Army’s strength lies in a number of these less-visible aspects. British infantry (at least the regulars – there are also Territorials present, with their own pieces) usually has superb morale, and very good leadership. That last shows itself in the quality of the leaders themselves, the number of them present in scenarios, and the “spread” of the leaders’ ranks – British leaders are spread in a bell curve with most of them Captains and Lieutenants fewer at higher and lower ranks. That makes it easier to arrange “chain activations” of maneuver units, representing a high level of command and control. British artillery – when it shows up - is usually out-gunned by that of the Germans; the new 25-pounder is a fine weapon but delivers less firepower than the ubiquitous German 105mm howitzer (13 factors for the British gun, 16 for the German weapon). And many British batteries are still equipped with the even lighter 18-pounder (firepower of 10). Thanks to the quick move northward, supply and equipment shortages, poor liaison arrangements with the French and the rapid retreat, in many scenarios the British are forced to fight with no artillery support at all. On the plus side, along with the British Army’s Territorials the Brits also have Royal Marines. There aren’t many of them, but they’re Marines: high morale, high firepower, high self-esteem. Britain does not stand alone in this game: there are French units present as well. They don’t appear in huge numbers, and by the time they do show up it’s late in the campaign when units are mixed together and some have lost hope. But for the most part these are the divisions of the First Army that surged into Belgium in May 1940, well-trained and well-equipped units on par with those of the Germans for the most part. Their tanks are superior machines, but like the British lack the tactical flexibility of the Germans and are much less efficient (in game terms, they’re harder to move toward the enemy and shoot less often). They have small infantry platoons, like the British, and their artillery is usually much weaker than that of the Germans (the legacy of all those Great War-era 75mm field guns still in service). The Germans, for their part, are not the overwhelming war machine of myth and legend. Parts of their arsenal are indeed formidable: well-trained and exceptionally-led infantry, outstanding armored command and control, and marked artillery superiority. Their best tanks are barely a match for the mediocre British cruiser tanks, let alone the excellent French Somua S35. The Germans will not win many scenarios through simply overpowering their opponents, but through careful exploitation of their many tactical advantages. Road to Dunkirk is another example of what I want Panzer Grenadier (and all of our games) to be: a solid intermixture of game play and history, with a great deal of depth and replay value. This is a very fine effort by Philippe, Guy, Matt, Susan and Daniel and I think you will like it very much. I know I do.